Eventually I moved on to other reading obsessions and the re-reading stopped about age 10. Which means I haven’t read Little House in the Big Woods for roundabout 35 years. Reading it again is an eerie experience for someone who once knew it more or less by heart, and not just because I’d forgotten the overall shape of the book. At the same time it makes me remember my childhood fantasies, the book itself is the collected memories of a woman looking back to the year she turned 5. Reading it again is, in other words, a strange experience of doubledness. As a child I imagined myself as Laura, that “little half-pint of sweet cider half drunk up!” Now — well, who am I as I read this book? A 6-year-old once again? Myself as a 40-something academic (who is, eccentrically, reading a children’s book)? The elderly Wilder, looking back? Or even her middle-aged daughter Rose Wilder Lane, who likely served as ghostwriter for the series? Once upon a time, sixty years ago, a little girl lived in the Big Woods of Wisconsin, in a little gray house made of logs. The great, dark trees of the Big Woods stood all around the house, and beyond them were other trees and beyond them were more trees. As far as a man could go to the north in a day, or a week, or a whole month, there was nothing but woods. I dare you to come up with opening lines as evocative as these. With three sentences, Wilder blows out of the water every single fairy tale I’ve ever read. 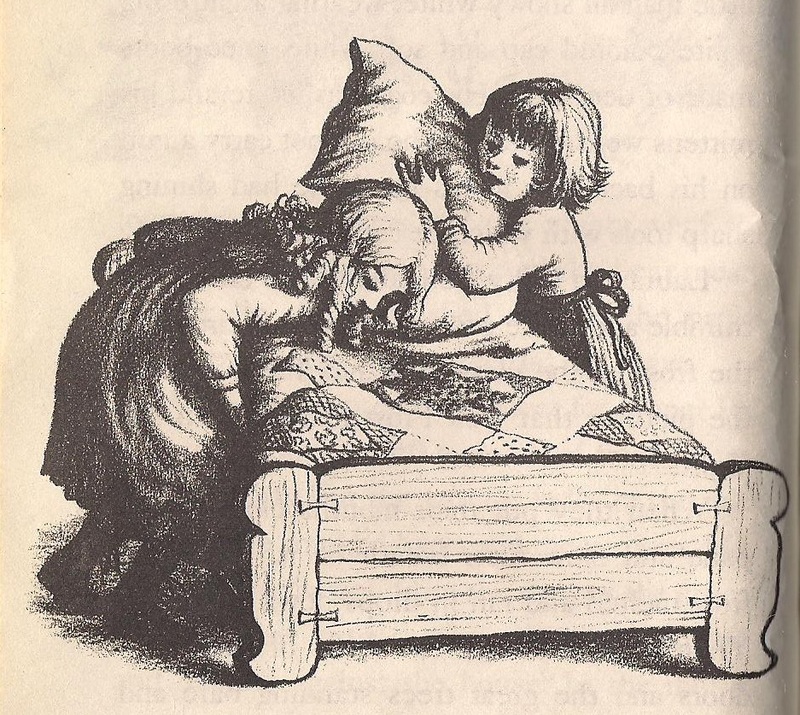 And let’s not overlook the way the book was printed — these lines are framed by Garth Williams’ 1953 illustrations of Laura skipping toward us, with her family behind her. Opening the book to this page is like being greeted both by an old friend and by a family that might be your own. Did I mention my father grew a beard about this time? It’s easy to remember a few major elements, like the fact that it’s written much more plainly than the later volumes — this book is written for 4- or 5-yr-olds, or 6-yr-olds who can read on their own. 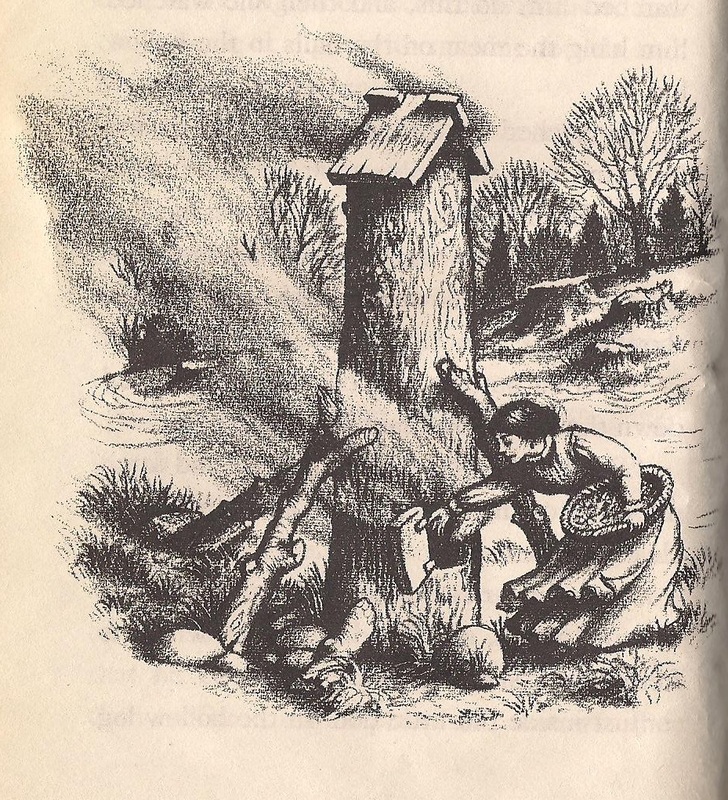 Wilder opens with her family preparing for winter — smoking venison inside an upright log, stacking their attic with root vegetables and salted fish, butchering the pig. No one ever forgets the scene in which Laura and Mary play with a balloon made of the pig’s bladder, but I’d forgotten that their favorite specialty was chewing on the roasted pig’s tail. Little House in the Big Woods is an episodic, anecdotal story of four seasons with this family, and it feels like a conversation with an exceptionally exacting granny — a woman who knows when to load you up with detail (how to prepare said pig’s tail for roasting; how to make bullets; what Aunt Ruby and Aunt Docia’s fine dresses looked like, and how they arranged their hair) and when to just spin a great tale, like when Pa tells them the story of when he was a child, and he and his brothers sneaked out on Sunday afternoon to go sledding against his strict father’s Christian rules, and how misadventure followed. I’d forgotten — repressed, perhaps — that the sledding story ended with a royal whipping. I’d also forgotten that Pa tells her this story after Laura disobeys his own more lenient rules for Sunday behavior. It’s unsurprising that I would have forgotten the whipping(s), because this is a book about familial love within a very tight nuclear family. All of Wilder’s memories have a hazy glow about them of love and pride and respect. Extended family members appear occasionally, but those scenes aren’t as significant as Laura’s love for her father, the relationship that dominates the book. Little House in the Big Woods is just about the most ideal situation one can imagine for a little girl. What should we find most disturbing about this scene? The fact that even during the 1860s brown-haired girls felt inferior to their blonde sisters? That Laura should be the only one punished for this sisterly spat? As a child reader I blew past both of those objections to the fact that Wilder is ridiculously generous to her sister, considering scenes like this in which Mary appears as a self-important prig. Wilder insists throughout that Mary was a good and well-behaved girl in contrast to Laura’s impetuosity and athleticism. Even knowing that Mary would eventually go blind (in By the Shores of Silver Lake, book #5) and therefore perhaps deserved special pleading, I always distrusted Wilder’s rosy account of her sister. 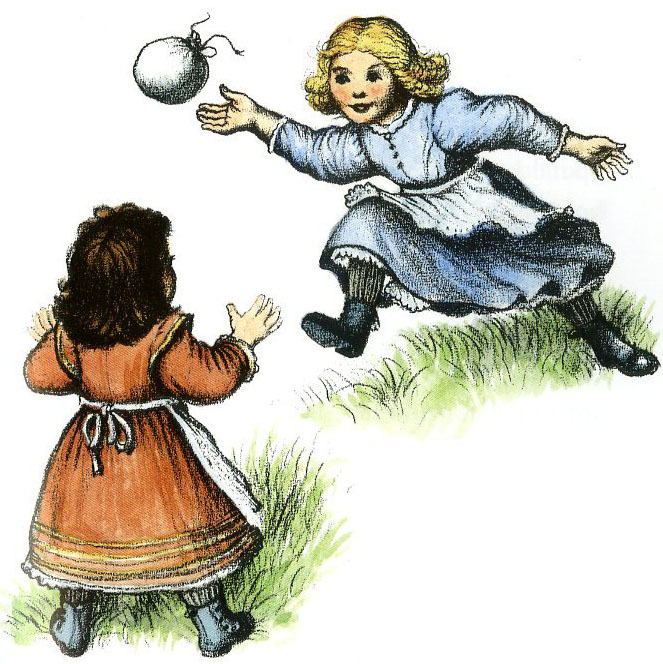 Mary was bigger than Laura, and she had a rag doll named Nettie. Laura had only a corncob wrapped in a handkerchief, but it was a good doll. It was named Susan. It wasn’t Susan’s fault that she was only a corncob. Sometimes Mary let Laura hold Nettie, but she did it only when Susan couldn’t see. You see? 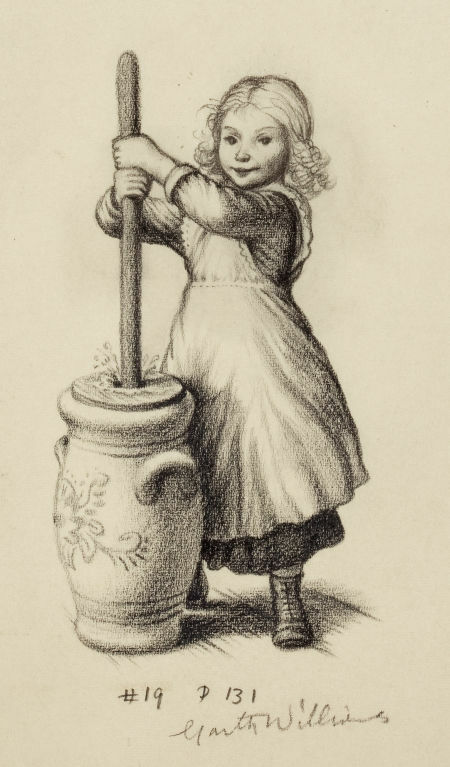 Don’t you fall in love with a little girl who’s that considerate of a corncob doll? The other trick Wilder pulls off is explaining in vivid detail the dangers that surround this Little House without terrifying little readers. The way an owl hooting in the dark woods can scare the bejeezus out of a child. The ominous presence of black panthers, who might chase a man riding a horse home at night. The time Laura and Ma go out to milk the cow on a black, dark night and run into a huge black bear — but it’s so dark that Ma mistakes it at first for Sukey, and she gives it a good smack on the bear’s rump. 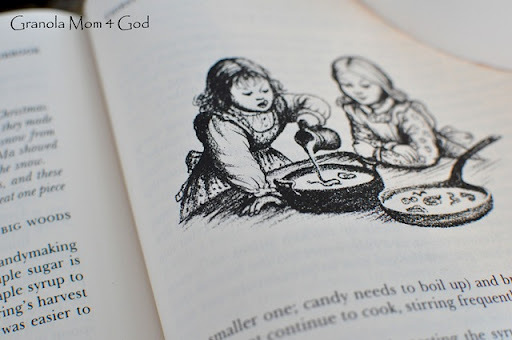 Somehow those tales never gave me nightmares, perhaps because of the reassuring presence of Ma and Pa throughout … and perhaps the regular appearance of exotic sweets like molasses candy, cooled in a pot of snow. Pa’s blue eyes were snapping and sparkling. 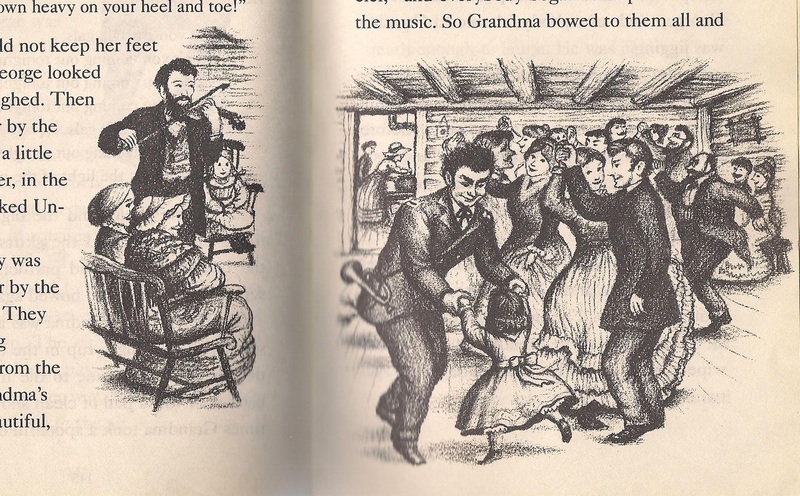 He was standing up, watching George and Grandma, and the bow danced over the fiddle strings. Laura jumped up and down and squealed and clapped her hands. This scene is so delicious that I cried upon re-reading it. I should note here that my own granny wanted us to call her “Grandmother” and exemplified the lace-curtain Irish stereotype; she told stories of a comparatively exotic and cosmopolitan childhood roaming the 1910s and 1920s streets of Manhattan and, although she could demonstrate how to dance the Charleston, would have seen jigging competitions as gauche. Oh, how I wanted a granny who could jig, whose eyes “snapped,” and who lived in the Big Woods. Despite the narrator’s heroic efforts to describe everything, there are hints of unknowability: the book is filled with song lyrics, some for tunes I still don’t know and which baffle even now — I was surprised to feel a familiar ache for lack of knowledge about those mystery tunes with strange lyrics. Who in my generation ever grew up knowing obscure lyrics for “Pop! Goes the Weasel” and “Yankee Doodle”? Who ever heard of a song about a “old darkey” named Uncle Ned or a poor husband whose wife only lets him drink whey with no cream in it? I didn’t always revert back to emotions I’d felt as a 6-yr-old reader. I experienced odd moments realizing I can now reconstruct the book’s context. “Uncle George has come back from the Civil War!” I said to myself with odd realization during the scene when George takes his bugle outside and wails its song into the woods. Likewise, when Laura gets her first chance to see a real town — of Pepin, Wisconsin — I quickly raced to find Pepin on a map, something I’m quite sure I never did as a kid. I remember, too, being confused by that opening line, explaining that the book happened “sixty years ago” — not knowing that the book was originally published in the early 1930s. Considering that it never, ever snowed in my hometown, I can surely be excused for seeing the whole tale as so exotic that it must have existed out of time. But Laura lay awake a little while, listening to Pa’s fiddle softly playing and to the lonely sound in the Big Woods. 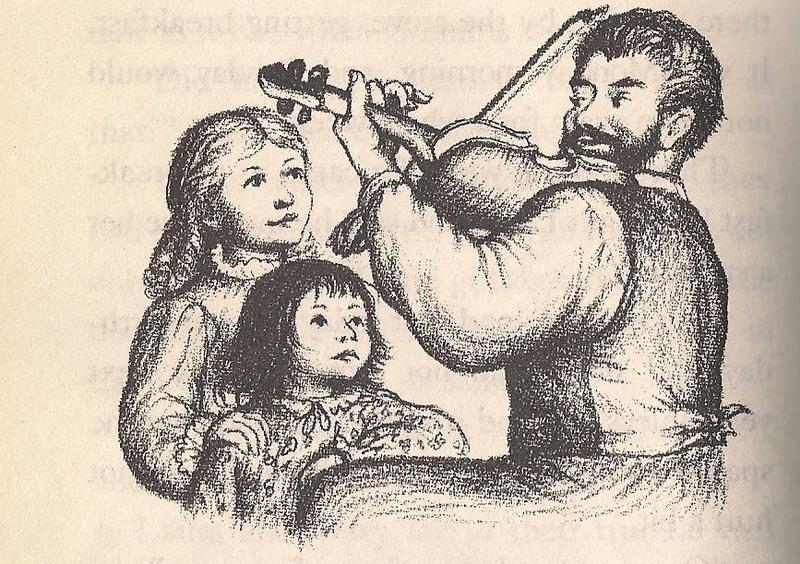 She looked at Pa sitting on the bench by the hearth, the fire-light gleaming on his brown hair and beard and glistening on the honey-brown fiddle. She looked at Ma, gently rocking and knitting. I’m weeping a little bit now as I type. And I ask you, was there ever a more philosophical concluding page in the history of children’s literature?